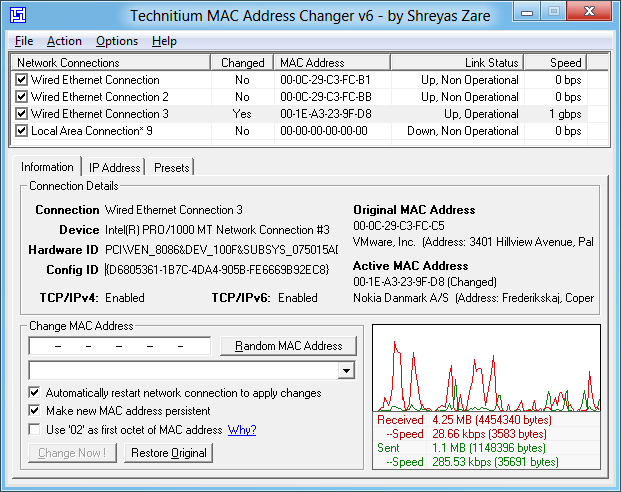 The user of a program can change the mac address of pc. The program checks the mac and if the trial not ended, it continues. Or the pc which has licenced mac address will have free program usage. There are bad boys cracking programs. But i know there is a way to get original mac address. I searched a lot in the internet and i didnt find anything. There is properties in the Network adapter. When i use getmac command in cmd, it gives the same VALUE in the picture. But if i click "Not present", and press ok, if i use getmac command in cmd, i get the original mac address. So i thought, if i want to check an original mac address of a pc, i can firstly select not present (Programatically, the problem is that i cant do it programatically) and get the original mac address, then after i can set the old valued mac address, so the low level hackers cant realize that i am restoring the original mac address. I know assembly, C#, vb.net and c++ but not delphi (. Any code or suggestion will make me happy. if you help me i will be happy friends.